Video, sketchnote, slides, and transcript below. Ways to transition customers from paying $X00 a month from your four-column-SaaS-pricing-grid to paying $X,000 or $X0,000 for Enterprise software contracts. Ways to optimize that four-column-SaaS-pricing-grid to increase your revenue without meaningfully decreasing conversions. Click to enlarge (but note: 14 MB). Patrick McKenzie: Hi, everybody. I’m Patrick McKenzie. We’re going to do a little bit of audience participation in this, so just to give me a feel for who’s out here. Can you raise your hand if, like me, you’re a developer? OK. Folks who are in marketing, sales, business, et cetera? Patrick: One more show of hands. Who here has a Twilio app that’s in production that you’re selling to customers right now? Last year, I talked mostly to developers. This year, it’s mostly going to be to the business stuff, although developers can make the things we’re going to talk about in this presentation to generate the sales. Then, if they can’t come in, rather than that person just disappearing off the schedule and the doctor losing the revenue for that slot, we can quickly rebook a different person into the slot and save them revenue. This is not really a presentation about me. It’s a presentation about you and your businesses, how you can make more money with them by learning how to do sales a little better. There’s two prevailing models of sales. One is called low‑touch sales ‑‑ you have a website, people come to it, they sign up, they use the free trial, they pay you on their credit card a month later, largely without talking to you. Then there’s the high‑touch sales, where we’re dealing with big freaking enterprises, steak and various entertainment budgets, and then a chicken gets sacrificed and six months later, a PO gets issued. I’ve actually done both of these. I’m an engineer, I’m, by default, not really great at either of them, but I’ve learned a few things over the years. We’re going to talk about how you can improve both your low‑touch sales and your high‑touch sales. One interesting thing in the software industry these days is that there is a hybrid model. One of the most important things that happened with the SaaS model for software is that because you can get up to $500 a month of revenue from a SaaS service ‑‑ and customers will frequently be on your service for a year, two years, four years ‑‑ that brings in four‑figure to low five‑figure lifetime values into the zone that you could possibly attack with the low‑touch sales model, where that was never possible before. Hybrid sales is one of the very interesting spaces, and I don’t think that we’re taking enough advantage of it, so much of this presentation is going to be showing you how you can make hybrid sales work better. You can also use the hybrid sales approach to have the customer start out with the low‑touch sales, like many of you might’ve started out with Twilio ‑‑ just sign up on their website, give them a credit card, you get $30 of free credit. Then that person becomes an infection vector into their enterprise ‑‑ that’s a bad way to put it, maybe a “brand advocate” into their enterprise ‑‑ so that when the enterprise says, “Hey, we have needs. We need a service‑level agreement and you need to have HIPAA compliance,” that’s an excellent opportunity for them to talk to the sales team and maybe we can get a steak ordered. Price based on customer perceived value. Don’t price based on cost. This is a severe temptation for people who are building Twilio apps because we know that, OK, a phone call costs me two cents a minute, so if I bill it out to my customer at three cents a minute, that’s a great outcome. That is a terrible outcome for you. Great outcome for your customers, because you are ridiculously undercharging your software that way. Your customers do not perceive the value of your applications as being dumb telephone pipes. If they wanted dumb telephone pipes, they could get them from AT&T for like $14 a month. They value the business logic and the business results that your applications can provide. Let me give you an example from one of my customers. He runs an HVAC company. He sends out a van of three guys to somebody’s house. If they can’t get into the house because the homeowner forgot that they needed their water heater replaced today, then they lose about $300 worth of salary upfront. Because your home water heater being broken is typically an emergency for the customer, the customer will often get home from work, realize that water heater is still broken and call somebody else from the phone book, so they lose a $2,000 to $5,000 sale. This customer has emailed me and said that I’m putting his daughter through Harvard because of the amount of money just automated phone calls are saving him every month. Now, he doesn’t know this, but I’ll tell all you guys. It cost me $1.96 to make those phone calls for him for last month, but I’m putting his daughter through Harvard. Clearly, an equitable arrangement is not charging him four dollars a month, based on cost plus pricing. It’s charging him a portion of the value his business is generating. I charge him about $200 a month, and he tells me he would pay 10 times as much. Segment to capture customer value. You will have customer who have things about them, either their use of the software or particular features that they need, which describe that you are creating much more value for their business than other customers might be receiving. One way to segment is ‑‑ you’ve all used SaaS before and it has that lovely little four‑column chart? The four‑column chart is becoming a standard in the SaaS industry because it’s widely superior to a lot of other methods. If you just had one monthly price for the software, I will tell you, 99‑percent probability, I could write out three columns, knowing almost nothing of your business, and your revenue would go up the next month. Similarly, if you have an overly complicated pricing grid, sales tend to go down. This is something that I’ve tested out with a bunch of my consulting clients. Another thing. For low‑touch SaaS, metered billing is an anti‑pattern ‑‑ metered billing being when you are charged linearly with respect to usage. Why? Your customers’ usage is typically very low, like the guy who needs a buck‑96 a month worth of usage. Customers have a high perceived cost associated with uncertainty. Give the customer what they ask for, which is predictability and being able to buy a solution that works for their needs, and then charge them for that. Also, for selling to businesses, always remember this. You are not taking your customer’s money. You are taking the business’s money. No customer feels a pain in their life. They don’t have to hold out on going on a date with their wife just because they paid you $20 more or $100 more. Typically, they’re not compensated based on shaving of $100 a month from their business expenses, because on business scales, $100 a month, it doesn’t move the needle for most businesses. Don’t aggressively price your products. Price them according to value, such that you have a nice business and they have nice value created by using your stuff. Let’s do a pricing‑page tear‑down. Here’s the pricing page for Appointment Reminder. I could show you some consulting clients and the various changes I made to their things, but that gets into NDA territory, and I can spill on my own stuff. Let’s show you the important things. This thing at the top, the headline, “Pays for itself in one saved appointment,” that’s called an anchor. We’re anchoring the price of this solution to the business value that the customer is receiving from it. Notice that we’re not using the anchor, “A phone call costs two cents. You can make 100 phone calls for only two dollars.” No, we anchor it to the business value. The way I chose these numbers for ‑‑ you might not be able to read it. It’s Professional, Small Business, Office. 29, 79, and 199. It turns out that there’s industries in which $29 is a common price point for an appointment, like, say, mid‑end hair salon. $79 might be a common price point at a, say, high‑end spa. Then 199 is a common price point for something where people drive to your house, like an exterminator. One of the things that customers do is they auto‑select into, “My appointments are worth about $100 bucks, so I should be going into the $79 plan,” even if their usage ‑‑ which was way lower on the thing ‑‑ would only put them in the $29 plan. Also, take a look at plan names. Many SaaS businesses go for fanciful plan names, like, “You should buy Bronze. You should buy Silver.” That’s typically not optimal. You want plan names which convince your customers to upgrade themselves into the higher plans because they feel that they need them. True story. I used to work at a big freaking mega‑corp, and I needed to use a SaaS. I think it was Crazy Egg. I wrote out the requisition request for my boss, said, “I’ve run the numbers, boss. We need a hobbyist plan that’s nine dollars a month.” He opens up their pricing page, scratches out “hobbyist” in red ink, writes “enterprise,” scratches out nine dollars, writes 4.99, sends it back to me for approval. Crazy Egg got $490 of extra enterprise revenue. Sadly, my boss would not pay me my enterprise salary. Most actionable tip you’re going to hear today. If you don’t already offer annual billing, you’re going to start. This tip is going to pay for your trip to Twilio because there’s a specific way that you can offer annual billing that your customers will massively uptake, and it will make you ungodly amounts of money. Why do we like annual billing? Because getting money upfront is better than getting money over time, all of the time. Because doing annual billing will decrease the turn rate for your customers and turn kills SaaS businesses. If you want the full math on that, ask me later. I’m a math geek. And because this often solves pain points for your customers. They have to fill out a requisition every month when that credit card charge comes in, and they’re a little annoyed by that. It’s not their money, but it’s their time every month filling out that requisition form. Solve a problem for your customer by getting all that money in one little itty bitty requisition form upfront. The combination of that discount plus the exclusivity plus the perceived risk that the offer will go away, because you’re only offering it to them once, will mean that instead of like one or two percent of your customers upgrading 10 percent, or in one of my client’s cases 25 percent of customers upgrade, 25 percent times 11 months of revenue upfront is a big whack of cash flow when you send this email. I have done this at several customers. The first time we send the email to a list of…say there are hundreds of thousands of customers, we ended up receiving hundreds of thousands of dollars of revenue the same day the email was sent. Seriously, implementing this will take you less than 30 minutes. It should be the first thing you do when you get back to your businesses. Other low‑touch stuff that works. You all have websites, and you use AdWords, SEO, OneUp. Those are very deep topics, and I’ve talked about them 100 times. I won’t be talking about them now. Here’s a quick win for you. If you don’t already have Olark or some sort of live chat widget on your website, put it there. Have people be in it during common business hours. That has doubled sales at some of my customers just by doing that because some people just feel that they need to talk to a real person behind the counter to actually trust a business. This is particularly common in less‑techy niches. Fully functional free trials, many of you probably already have that, or you have first month free with a credit card sign up. We’re going to be talking about specific ways to optimize them in a few minutes. Email, email, email. We’re going to talk about that a lot, too. Let’s talk about product tours. What is a product tour? A product tour is a first‑use experience, so we take someone through either their first time using the software or early in their life with the software to expose them to the richness of the software and to make them feel awesome. Why do we do this? Because if you just have the common free trial that someone gets into, sees their dashboard, 40 to 60 percent of those users will close out of that application, and they will never come back. If you’re spending $10,000 a month on Google AdWords ads, you’re setting $5,000 or so on fire because they see the app once and never come back. We have to make that first‑use experience of the software totally rock. Dropping people in dashboards doesn’t rock. Giving people customization screens doesn’t rock, so we’re going to show them the fun bits and make them feel the experience of becoming awesome through using your software immediately. How are we going to do that? First, we are going to demonstrate one awesome improvement that the app has already made in their life in the first five minutes of using the software. Second, we’re going to establish a reason why they should come back to it later. Third, if there’s any social component, like if any of you do productivity apps where the entire team has to be in the application, we’re going to request that they invite the rest of the team into the application. That is a major, major win. Literally increased sales by about 30 percent at one customer of mine when we just started asking them explicitly to invite your team in at the end of a three‑minute trial. Appointment Reminder. I didn’t launch with a product tour. I started it about two months after launch when I realized that there was this problem. My typical customer behavior was that people were signing up for the free trial of the service. But they scheduled appointments about four to six weeks before the appointment was actually supposed to take place. The free trial is 30 days. At the time where they’re making the go or no‑go decision on Appointment Reminder, it hadn’t actually called anybody, and why would you pay for something that calls people if it never actually calls people? Many people made the decision, “I’m not really getting value out of it. I don’t want my card charged for 200 bucks. I’m gone.” Similarly, 60 percent of people were abandoning the product on the first day and never coming back. I changed up the application to give people the experience of this app being awesome on the first day. How did I do it? First, when customers get into the application, I ask them for their phone number and say, “We’re going to give you a quick little demo call.” Make a semi demo call just like they were getting a call like their customers would get a call. They see, “This is real. It’s not just some scam on the Internet. The software does actually work.” Then we teach them how to schedule appointments in under 30 seconds, then teach them how to manipulate [laughs] appointments in under 30 seconds. Then we tell them what they should do next. This would be a great opportunity for selling the benefits that’s going to make for their organization, but I just haven’t implemented that yet because I’m stupid. Best thing that you can do in the tour. There are features in your app that are especially sticky. If you look in your old data, there’s something or if you have a feel of what the happy customers look like, you can identify certain features as being positively correlated with the happiest customers, the ones that are getting the most value out of it. Introduce those features right away. Don’t hide them in the third screen after customization. You will see a major uptake in those features and hopefully an uptake in your customer metrics after that. How many people sent less than, say, five emails a month to customers in their first month of the software? Raise your hand. Yeah, hands up? You all should be emailing people more than you do. Ask them for their permission to do it, but many of your customers will receive a lot of value from you if they trusted you enough to give you their credit card or to sign up for a free trial. Wlk them through that free trial. Make them have the successful first experience with that trial. How can we do that? Why would we want to do this? Conversion to paying sign‑ups straight off a website is very low. One percent. If you optimize it like heck, you can get it at two percent. But if you offer people a free incentive in exchange for their email address, you can get 20 to 40 percent conversion rates to that. Many people can’t say no to that. In the course of that drip campaign, you first educate them on things in your problem space. You persuade them that you are an expert on this problem space and that you are a credible individual and a credible company. Only then you try selling them. When you try selling them, many of them will be happy to buy at price points which they would never have considered two weeks ago before they knew you. I’ll show you an example of something I did for a client, and the client told me I could talk about this. This is WPension. They give you a little free inspection of your website that will tell you, “Hey, it’s loading at 4.6 seconds. It could load faster if you do some things. Here’s how to do that.” They’re a hosting company. It offers on the page where you get this free inspection, “Hey, click this box. We’ll give you a free one‑month course on improving the security uptime, et cetera, of your WordPress site. Many people opt into this box.” Then what we do, we hit them with a sequence of emails over the month to demonstrate credibility. Then the fourth email is, “How hosting matters for your business,” and this is where they start selling. They say, “Look. If your website goes down in the middle of you being on the Oprah Winfrey show, you’re going to lose tens of thousands of dollars. That five‑dollar‑a‑month WordPress hosting that you’re on that goes down and gets virus infected every month doesn’t look so cheap anymore, does it? “We have an option managed by the WordPress experts, and it only costs $200 a month, which is honestly nothing next to the business value created by your website.” That email and the subsequent emails in this sequence absolutely prints money. More advanced uses of email. So you can use someone’s interaction with your applications to drive targeted emails specific to that person and to their situation. One example is when they start using the software, obviously they sign up instantly and get a thing from the website with a link to log in and their email and password. Well, don’t put their password in there, but tell them they can reset it if they go to this page. Maybe you want to just automatically send an email delayed a little bit and say, “Hey, this is just a personal welcome from the CEO.” This is something that we don’t do nearly enough as small businesses. We’re afraid of being compared to Oracle and IBM and need to seem bigger than we are. Why don’t we use the smallness as a strength? Say, “Hey, I’m the CEO. I built this product. If you have a problem with it, I want to hear from you. I will to fix it.” We should throw our little itty bitty weight around. If the customer looks like they’re going to cancel because they signed in for Appointment Reminder three weeks ago and they haven’t sent a single appointment, they’re probably not getting much value out of it. Trials that expire without giving you money are worth absolutely nothing to your business. So giving them a trial extension is almost free to you. Maybe it costs a buck a month extra to provision that folio thing will print money for the business. If the client doesn’t use one of those sticky features that you know is a sticky feature, send them a getting started guide or a case study on how some other customer of yours used that feature to a great extent in their business. Then maybe at the bottom of that say, “Do you want to get started with this but don’t know how? Send me an email. I love talking to my customers.” As the client is getting to a decision point about the software, like are they going to make that renewal decision or do they need to upgrade with a credit card? Provide them the ROI calculation for that. People love getting this email every week because who doesn’t like hearing, “Yeah, I made $6,000, which is 4,000 more than last week.” They love getting this email. It creates actual value for them, and it creates another touch point for him. Say, “Hey, you want to keep getting these emails from Planscope? We need your credit card details.” That works out great for all involved. There is an eight billion pound gorilla in the room for appointment reminding services and they and nine other similar firms plus myself were selected by a particular American hospital. It wasn’t St. Jude, but let’s call it St. Jude anyhow just for the sake of illustration. St. Jude needed a wee little itty bitty project done. They needed appointment reminding for it. They came up with a list of 10 people after searching for them on Google, and then they went out to each of the 10 of them and said, “We’ve got some questions.” A sales guy looking at his calculation from a sale that might only be $100 or $200 is like, “Well, that won’t buy me a cup of coffee.” They sent out a brochure, and then they go working on their more important accounts. They had a down-select, which means they got rid of many of the people who were in the first run of the competition and it came down to the 800‑pound gorilla and myself. Then they had a little debate about it internally, and the debate went something like this. I won that sale, and I parlayed that sale into 8 of the top 10 hospitals in the United States [Patrick notes: I used to quote this a lot but I’m unsure whether it is literally accurate given that I have a fuzzy definition of who constitutes the Top 10.] from Bumble in Japan. So you totally can do sales. Let’s talk about some ways to do it. Remember. You are not being bought by the person who is using the software. There are other people in the organization whose opinions you need to influence, so make that a priority for yourself. Customers can request a high‑touch sales process when they start in a low‑touch thing, like saying, “Hey, I’m on the $29‑a‑month plan, but what’s your auditing story? I need full access to server logs.” “That’s totally something we can do. Talk to the sales team right now” The expectation for things are very different. We’ll talk about how to manage those expectations and use them to transition people into more valuable relationships with your business. I don’t even love this slide, so I’m going to skip it. You will eventually be passed over to a purchasing department after you have agreement in principle with someone in the organization that they should be using you. Purchasing departments and their users have an adversarial relationship. The user wants to get their work done. They know you’re the guy to do it. The purchasing department theoretically needs to get that bought. They get scored on buying it for the lowest price possible. They don’t want to have the blowback from saying, “You can’t buy that.” But they don’t really have an incentive to getting this deal done because it doesn’t make their life better either way. This is the little sales cycle at the bottom. The real places that you can hack it are at the formal quote stage and invoicing. Let’s talk about how. But they need to buy that. They need to be able to buy that to be able to buy your thing, so sell them that. Industry‑specific buzz words. “What’s your HIPAA compliance story?” You can charge through the nose for these because they are a large business, top eight hospitals in the United States. Figure out how much health care they sell. Health care is really expensive. They have money. These are various things that you can offer a large business in the sales cycle, which will increase the size of the account to you without meaningfully causing more resistance from the purchasing department. 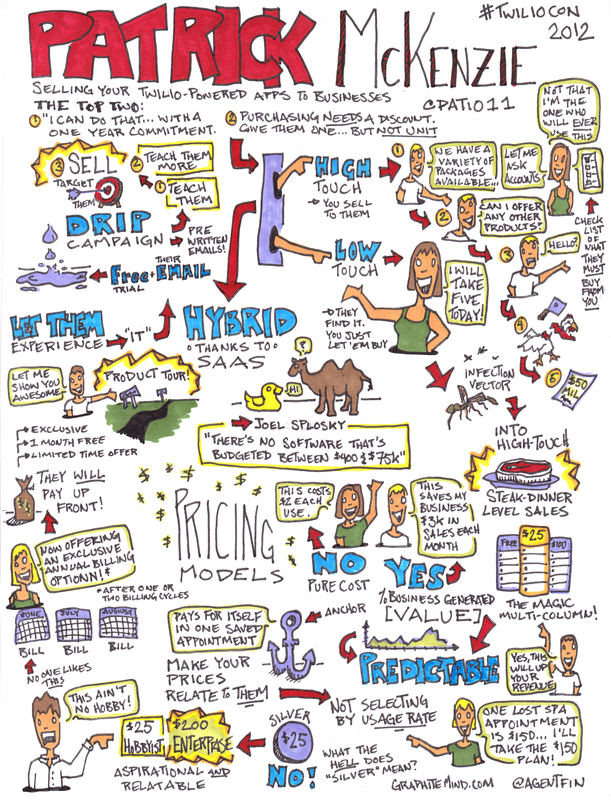 Things that you can anchor your prices against when you’re charging to enterprises. By the way, when you’re charging enterprises, it’s like four to five figures a month. You’re no longer talking about a couple hundred bucks that you can put on a credit card. The fully loaded cost of one employee is a good anchor. The fully loaded cost of a developer in Silicon Valley is $20,000 a month. You save him 20 minutes a day. Do the math and it turns out into a real amount of money. If they’ve got 50 developers at the organization, hoo ha. Cut off something in them in that so that they feel like they got a win out of it, and then it’s a big win. Truck rolls are an incredibly good anchor for pricing, if you can decrease them. The guy who I put his daughter through Harvard was primarily concerned about the number of wasted truck rolls he had where he sent three guys out in a van to a house. Had to pay their salary, but they weren’t actually able to get into the house. Truck rolls have a huge cost which is known in industries that actually have fleets of trucks. High value employees. It’s easy to calculate the value for your time. Low value employees not so much. If they don’t measure the cost of, say, the office manager, then they’ll discount your value to the company. But if they do measure the cost, like in a call center environment, then 80 low‑value employees who save X amount of time that they know that they track, that produces a lot of value that you can take to the business and sell it on. Lost business, missing revenues, et cetera, also things that you can sell against. Let’s have a quick role‑playing exercise for how you answer any question that you don’t know how to answer about pricing. The answer is, “I can do that with a one‑year commitment.” Everybody repeat after me, “I can do that with a one‑year commitment.” Everybody? Audience member: I can do that with a one‑year commitment. Patrick: “Do you have Google Calendar integration?” I can do that with a one‑year commitment. “I need 60‑day net pricing terms. Can you do that?” I can do that with a one‑year commitment. “My legal department has some custom language that they need to run past you. Can you do that?” I can do that with a one‑year commitment. “We need you to fly out to Omaha and give an in‑service training activity for our team. Can you do that?” I can do that with a one‑year commitment. This greatly increases customer lifetime value, it provides massive value to their business, and it will make your sales conversations easier. If you ever give them a break on the price per call, like if you say, “It’s usually five cents a call. For you, I like you. I can do it four cents this one time,” you will never get that penny back, and next year, they will ask for three. You’ll make most of your money on the call, but the purchasing guy will be able to get his next promotion because he shaved $2,000 off that thing he wasn’t really going to buy anyhow. Finally, unfortunate fact of life. If you’re selling to big freaking enterprises, you absolutely need to have the corporate structure to shield your own house from something blowing up at a company. You should probably have insurance. Talk to your insurance agency about it. It’s usually called errors‑and‑omissions insurance in the United States. You want a lawyer to go through all of these contracts. Final stuff. I talked a little about email earlier. I can actually talk about it substantially more. If you go to lifecycleemails.com, there’s a little five‑hour course from me that you can do about that. Customers tell me that it’s produced a lot of value for them. I have a blog with six years of posts, mostly talking about low‑touch sales. [Patrick notes: You are reading it]. I encourage you to try it out. My email is patrick@ any domain I own (including this one) and I’m @patio11 on Twitter. I love talking about this stuff. Feel free to talk to me at any time. We have a second for questions. Audience member: Are these slides anywhere? Patrick: They’re not yet, but I’m going to be putting them up on my blog later. [Patrick notes: Yep! Scroll up.] Thanks very much for your attention, guys.